Come and meet shoe design icon John Fluevog at their (hopefully) first store in the Netherlands. Such was the power of our Dutch designer reputation and fashion sense, that this is the first store to be located outside North America. 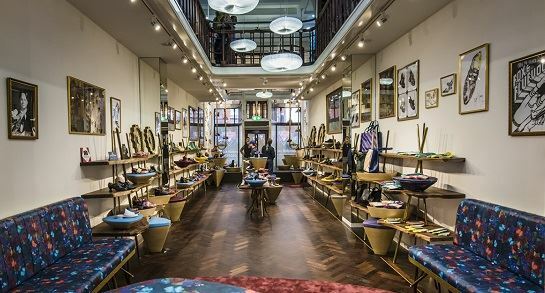 Learn about Johns design philosophy, where he draws his inspiration from and why he chose Amsterdam for the first store of his global expansion plans. John Fluevog is an independent Canadian designer and retailer of forward-thinking footwear, who has been creating ‘unique soles for unique souls’ since 1970. His earliest customers included The Beach Boys, Alice Cooper, filmmaker Robert Altman and a slew of slightly less famous Fluevogers. In recent years, John Fluevog has been using eco-friendly vegetable tanned leathers and water-based glues, reducing the environmental footprint of his production and keeping with his motto; good soles leave small prints (no matter what your shoe size). More recent customers include Beyonce, Madonna and Lady Gaga. His following among male customers is extremely loyal and growing rapidly. In 2012, John was recognized by The Two/Ten Foundation of Canada as The Canadian Footwear Industry’s “Shoe Person of the Year,” and John Fluevog Shoes was recently named one of the world’s most innovative companies in the fashion industry by creative business experts Fast Company. Traditionally made in old world factories, Fluevog shoes are produced in small runs, are fully repairable, and with their look of quality and timeless luxury, always stand out in a crowd. When you wear a pair of Fluevogs, you’re wearing 47 years of traditionally made untraditional design. For men and women of all tastes, bring your colleagues, friends and family to this unique event. Try some on. Meet a very unique soul. Network with your peers and enjoy a borrel - Vancouver style. Purchases on the night will receive a discount as a thank you for coming out. Make a night of it and do something nice in Amsterdam - there's lots of things to choose from. If you have problems registering on our website, you can also register via Eventbrite by following this link.